Because of the partial government shutdown, the White House did not have the residence staff to serve dinner to the Clemson University football team. So the President got take-out. Using photographs, the Post figured out a detailed analysis. However, as they explained, from the wrappers, it was easier to know what McDonald’s sent than, for example Wendy’s. Still, their best guess was 177 burgers when they added together the Big Macs, Quarter Pounders, Wendy’s burgers, and the Whoppers. Since President Trump said there were 300, they hypothesized that maybe some were in the kitchen. Or maybe he was referring to all the sandwiches. Anyhow, the check for the entire meal was in the vicinity of $2911.44. Where are we going? Let’s look at some the resources they consumed. To make a quarter-pound hamburger involves an endless list of resources. Several environmental groups have just focused on the land, the water, the feed, and the fuel. We could start by knowing that there are approximately 94 million cows in the U.S. At 12.5 million, Texas alone has the most with Nebraska, Kansas, and California next. Meanwhile, Rhode Island only has 5,000. Once we talk about one quarter-pound hamburger, though, we need about 65 square feet for grazing and for growing 13 pounds of feed crops. 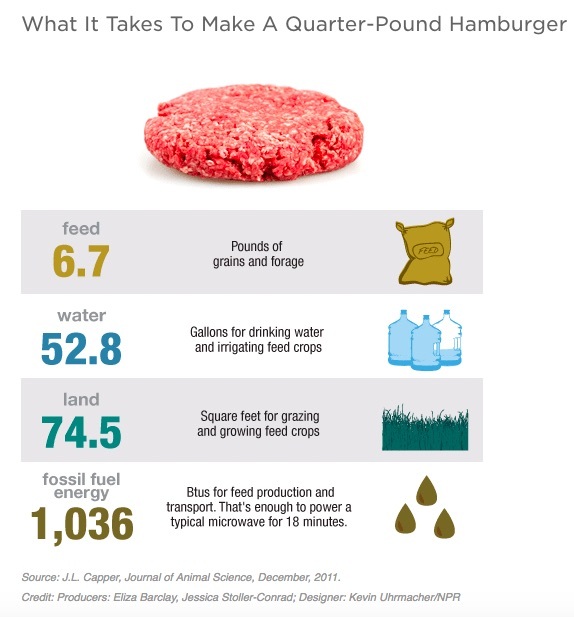 Also considering natural resources, according to one estimate, producing one burger requires 14.6 gallons of water. Another though, citing 460 gallons, vastly disagrees, perhaps because it also included what was used for the crops and the service water for cleaning. Whether making burgers or boots, we just need to return to land, labor, and capital. Asked how to produce any good or service, we always can name examples from the three basic factor resources. But for one small quarter pounder, moving from the ranch to the restaurant, we’ve only begun to list all of their land, labor, and capital. My sources and more: The Washington Post had the food story of the Clemson football team visit to the White House. From there, it got even more interesting with this BusinessInsider article, this NPR estimate, and. for the environmental impact, this paper on the resources in a hamburger. Finally, I got my state-by-state cow inventory numbers here. Our featured image is from Fast Company.